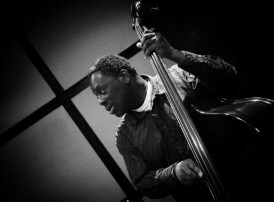 Neville Malcolm – Electric & Double bass – is one of the most in-demand bass players in the country. Known as ‘Level-Neville’, he is an understated star on both acoustic and electric bass, combining an earthy, soulful feel with effortless technical ability. Coming from a background in Gospel music, Neville started out playing organ and guitar, switching to bass as he developed an ever greater interest in jazz and other music. Turning professional in the early ‘90s, he worked with Philip Bent and Steve Williamson and became part of London’s Acid Jazz scene. He has since performed all over the world and recorded with Billy Cobham, Gabrielle, Tom Jones, Carl Orr, Alex Wilson, Nathan Haynes, Marlene Shaw, Dave Valentin and Jack DeJohnette. Most recently he has been touring and recording with two of the world’s best known jazz crossover groups, Incognito and Us3.